Nice pics guys, here is my latest redo, started in a cave system then thought , hmmm.. might want to start fresh with area themes, so here is my modern look section almost completed. I am really having fun doing this park, when it's complete I will show close ups, but I am taking my time to get all the details I can correct with what assets we currently have. So be a few weeks till then, hope you like what you see. This section you see here took me about 25 hours to complete. Can we not all agree this is the most BEAUTIFUL game ever made. That no exaggeration, I truly believe this is the most visually impressive game I've ever seen. It's all perfect, and I'm in love with it all. List ONE game that is more immersive, or more beautiful; you can't, it's impossible. And this is just screenshots, imagine playing it, with the glorious sound design, and ambience or birds and trees rustling. PLEASE have little birds fly around your park and land in trees, or butterflies around flowers, or bee particles. edit: another higher sneak peak (see a bit more ) if you look to that higher building on the left, there is a maintenance area for the park in the back of it all my buildings have employee entry and work areas I will show a video and pics in detail when done, can't wait for everyone to see it! How working screenshot in full screen? I using Print Screen button, but I got a black image?! I using Windows 7. Thanks! Your game looks absolutely brillant! Here are some pictures of my park. Two New Parts of my Park hope you like it ! Here some screenshots of my first park ever on Planet Coaster. I have started a park and have gone for a Mediterranean type theme for the park entrance. 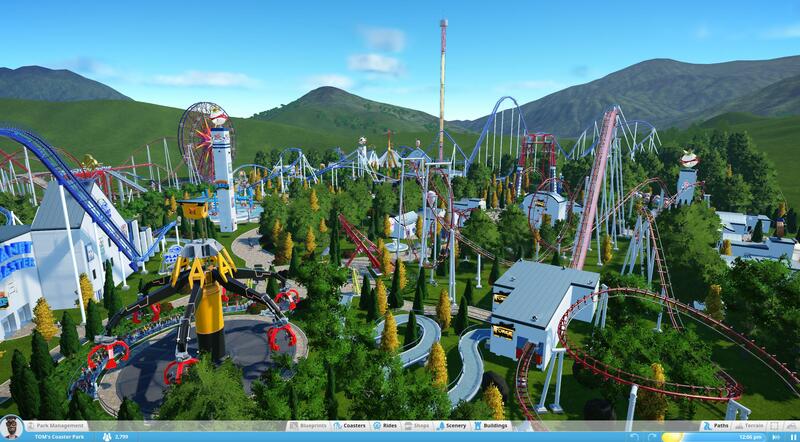 i will add a coaster using this theme also soon but here is my park so far. This mediterranean park is very nice ! I like also the other posts before, beautiful parks. I really like how "full" your park looks. I always try to make parks like that as i think those resemble real life park. My PC is too slow to record my game and since I'm not willing to fry my PC I've made screenshots instead of a YouTube video! I hope you like the first screenshots of "Pirate Deep". Here we have the town square, with a church and fountain. This is the whirly Rig and a house with a queue inside. This square has some façades on it. To attract people to this square I've made a toilet in one of them. Next to my town square I've made a little market with a "Hats Fantastic" inside. The first thing I've made is this harbor/tavern for the pirates who want to get drunk. The building is build against the mountain. To make a eating area I've used these barrels and concrete structures als chairs and tables. Across the river, that goas through the village there is another flat ride and the start of my first coaster! Once again the queue is inside the building. I've made a wall around the village and this is the entrance! See you soon in "Pirate Deep"
i now i need to try transition it from tight street to more open then into a pirate theme without it looking wierd. I think i will build a coaster next with the surrounds being a vineyard and station being a winery. Some more progress on my asian castle. Finished Park. I had to leave it here as no one was riding my rollercoaster anymore, it like they didnt even recognise they were there? I bet your paths have an issue, delete them and redo the paths (that aren't being used) and I bet they will start using it again.